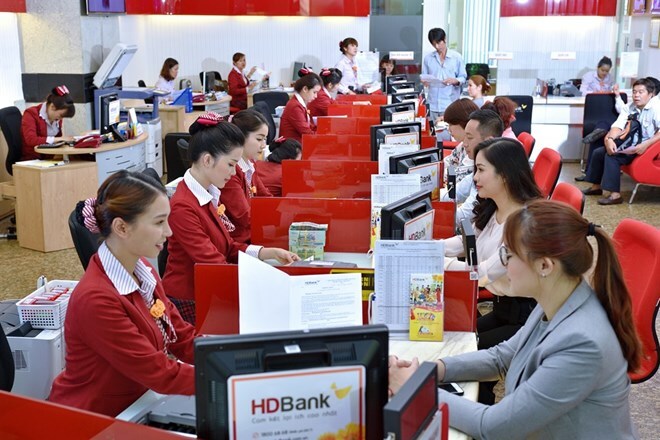 HCM City (VNS/VNA) - The Ho Chi Minh City Development Joint Stock Commercial Bank (HDBank) has announced its audited financial report for 2018 with impressive numbers. The bank achieved 4.005 trillion VND (172.6 million USD) in pre-tax profit, an increase of 65.7 percent over 2017 and its highest ever so far and exceeding the profit target. The impressive growth was thanks to a sharp increase in non-interest income, with net profit from fees increasing 2.2 times to 438 billion VND (18.87 million USD). Net earnings from foreign exchange trading also more than doubled to 298 billion VND. Net interest earnings were worth 7.64 trillion VND (328.8 million USD), a year-on-year increase of 20 percent. Total operating income was 9.44 trillion VND, up 25.8 percent. As of December 31 HDBank’s outstanding loans were 129.62 trillion VND, a year-on-year increase of 17.83 percent. The bank’s outstanding loans alone were worth 112.47 trillion VND, an 18.3 percent increase, with HD Saison accounting for the rest. The bank mobilised 194.63 trillion VND in deposits. Its total assets topped 216.05 trillion VND while owner’s equity reached 16.82 trillion VND and return on equity and return on assets were at 20.3 percent and 1.6 percent. As of December 31, the bad debts ratio (according to the State Bank of Vietnam’s Circular 02) of the parent bank continued to be tightly controlled at 0.97 percent, the lowest level in the banking industry. HDBank opened five branches and 40 transaction offices last year to increase the total number nation-wide to 285. The number of consumer financial transaction points increased by 2,323 to 13,825 as HDB retained its leading position in the consumer finance industry in terms of network size. The large networks help HDBank and HD Saison efficiently serve nearly seven million customers, especially in rural areas. There were many outstanding achievements last year. For instance, the lender’s stock, which listed last year on the HCM Stock Exchange, code HDB, has become one of the 20 largest in terms of market capitalisation and a favourite among foreign investors. One year after its listing, HDB has been added to the VN30 Index comprising the top 30 listed companies. It has been conferred the Labour Award, second class. Moody’s Investors Service has upgraded the long-term local and foreign-currency deposit and issuer ratings for HDBank to B1. HDBank is one of the largest contributors to HCM City’s revenues. It won many awards last year, including the 40 Most Valuable Brands in Vietnam from Forbes, the “Best Companies to Work for in Asia” award from HR Asia, the “Retail Banking Award” from the Vietnam Banks Association and the International Data Group, and the “Best Cash Management in the Asia-Pacific” award from Euromoney. HDBank also embraces social and community activities, giving scholarships to thousands of students, donating health insurance cards to 14,000 near-poor people and funding cataract surgeries for thousands of poor patients. It has also pitched in to help develop Vietnamese sports. Last year, for the eighth time, it organised the HDBank Cup International Chess Tournament, the largest international chess tournament in Vietnam.